The national bestseller and the first volume in Cormac McCarthy's Border Trilogy, All the Pretty Horses is the tale of John Grady Cole, who at sixteen finds himself at the end of a long line of Texas ranchers, cut off from the only life he has ever imagined for himself. With two companions, he sets off for Mexico on a sometimes idyllic, sometimes comic journey to a place where dreams are paid for in blood. Winner of the National Book Award for Fiction. Beautiful, evocative, harsh, and the truth is told throughout. Can't recommend this highly enough. Like all of Cormac McCarthy’s books that I have read, there is both starkness in the human spirit and an unbroken goodness in the human spirit. In the latter, however, that goodness is put upon beyond measure, just to endure. As a writer, there are few like him. His images are like a painted picture. There is a rawness in them, that feels as if everything has been scrubbed to the bone. There is no middle ground between good and bad, but it seems to be a toss of the coin as to who will win. 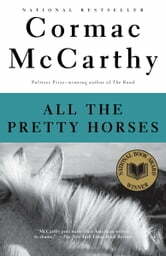 In All the Pretty Horses, one is left with a burned-out hope for our better selves, but at the end of the book, there is barely enough healing salve to keep it going. A totally superb read.